If there’s one thing I learned from wrestling, it’s that no one can make you starve yourself. Sure, someone can starve you by depriving of you of food, or overworking you if you’re malnourished, but if you’re surrounded by plenty only discipline can be make you abstain. Over the course of around three months from late 2000 into early 2001, I cut weight. When I started, I was 145 pounds or so. It was my senior year of high school. Around the same time, I maxed out on bench press at 195 pounds and I could deadlift 405. That season, I wrestled at 119 pounds, which was lower than I’d ever cut before. There were complications: On a couple of occasions, I fainted at school. At one point, while working out in a 120-degree sauna after 20 minutes or so at a health club, I simply stopped sweating. To this day, I can still remember how much a glass of water weighs—eight tenths of a pound—and I still have a soft spot for Skittles, which didn’t weigh much at all, but could be parceled out to at least give you the semblance of having something to snack on. I eventually paid a physical price for cutting so much weight—I’ll get to that in a minute—but I wouldn’t say I didn’t get something out of the deal. Just as there is a lot to learn from trying and failing to achieve something noble, the inverse is true, too. Succeeding at something ill-advised—in my case cutting too much weight—can be instructive. Deprivation can have its own lessons. I was a lousy wrestler on a good wrestling team in Minnesota, a great wrestling state. Despite its devotional name, Saint Francis High School is a public school in a state far more famous for Lutheran potlucks than its fealty to the Holy See. Calling St. Francis a suburb is a bit generous; at the time, it was a one-stoplight town, the kind of place where a new fast food restaurant was practically cause for a parade. Perched on the outermost ring of the Minneapolis-St. Paul metro area, it’s where the fringes of exurban sprawl overtake farm fields, one subdivision at a time. The lot where my parents built their house was no exception; it had been a rye field a few years before. A year or so after that house was finished, I started working in the fields that the farmer across the street didn’t sell. Having grown up relatively close to the Twin Cities, I was a know-nothing when it came to machines and farming, but thanks to the farmer, and his family, fixing fences and shoveling out grain bins was one of my first jobs. School started at 7:45, but most wrestlers showed up at 5:45, in order to run in the gym, followed by a light wrestling session. The first two rows of the parking lot could have been mistaken for a scrap yard; it was littered with old farm trucks fitted out with dual exhausts and dented Grand Ams with mismatched doors but add-on spoilers and subwoofers. Once I pulled my parents’ 1987 F-150 into the lot, I scrambled inside against the wind—wrestling is a winter sport—and I dressed in shorts and joined the dozen or so groggy wrestlers jogging laps from the main gym to the adjoining one. Between the dim glow of the halide lamps snapping to life, the incessant clop-clop-clop of Asics hitting the gym floor, and the fatigue from running hungry, an observer stumbling upon the scene might have mistaken it for a postcard from purgatory. Except for the music, that is, which is best described as a mostly country playlist that occasionally lost its mind. Garth Brooks and Johnny Cash were on regular rotation, but so were more eclectic songs; to this day I still know the lyrics to Johnny Horton’s “The Battle of New Orleans” and Lil’ Troy’s “Wanna Be a Baller,” both of which were practically played on repeat during some sessions. I cut weight and ran in the mornings for the reasons you’d expect. I wanted to make varsity. In a respect, it was my last chance. I was cut from the baseball team as a sophomore, and I played football for four years but never started a game. The only championship I ever won in high school was in speech. Wrestling was my last shot, so I put it before everything else, even my health. Many of my teammates had wrestled since they were much younger, some when they were only four of five. The same was true for the opposition. The little success I had—I went 4-13 overall—was due to temperament: I’m aggressive and almost glacially obdurate, even when woefully overmatched, which was most of the time. My frame didn’t hurt either—compact, but with broad enough shoulders to pack on the dozen or so pounds of extra muscle that would help me hang with wrestlers technically well out of my league. When it came to cutting weight safely, there wasn’t a lot of oversight. Prior to the start of the season, we had our body fat level analyzed, and a weight-certification form that was signed off on by a doctor, but this was in the early days of weight management in scholastic wrestling programs. In Minnesota, the form has since been amended significantly and there are now stricter limits on hydration. What’s more, most states—though Minnesota is apparently not among them—now follow the recommendations of the National Athletic Trainers’ Association, which monitors hydration carefully and stipulates that wrestlers should not lose more than 1.5 percent of their body weight per week when making weight. They also work in concert with the National Wrestling Coaches Association, which offers a myriad of calculators and nutrition plans to help wrestlers safely make weight. I didn’t have any of that. There was no team nutritionist, or any formal advice for cutting weight. Instead, there was an unspoken assumption that you’d make weight in order to help your team. I should note that I fully bought into this, and I hold no ill-will to any of my coaches, most of whom I remember fondly. In this respect, the sport was well ahead of the science, so coaches and players were largely forced to find their own way, much as is the case in football, hockey and other sports where concussions and traumatic brain injuries are a concern today. Still, I knew what I was doing at the time was unwise, and that it might be deleterious to my health. I did it anyway, as I wanted to succeed and I wanted to help my team. So I cut weight. I remember making 119 the first time—making 125 had always been simply a matter of discipline, but making 119 was a weeklong terror. Running and careful eating weren’t enough, as they had been at 125. Doing that made me plateau at around 123—to get to 119, I effectively had to stop eating, and above all, abstain from drinking water. I was well aware that I could have stopped at any time—opportunities abounded: all I had to do was go to a drinking fountain, or open one of the bottles of Dasani or Coke that I routinely stocked—and longed for—at my part-time job at a local pharmacy. Temptation was everywhere; at one point, I was walking into work and it was raining heavily, and I coveted all of the puddles I saw. The real trouble wasn’t getting to 119; it was staying there. Wrestling weigh-ins occurred an hour or two before the actual match, and wrestlers could then eat and drink after making weight, so everyone brought their own coolers. When I weighed in for the first time, I hurried to my locker and wrenched it free, protecting the little Igloo cooler that was full of a feast only a teenager could prepare: poptarts and milk and Powerade and sandwiches. This usually helped me get some energy back, but once my match actually started, things usually went the same way—I started out well in the first period, then I lost my energy in the second and third. 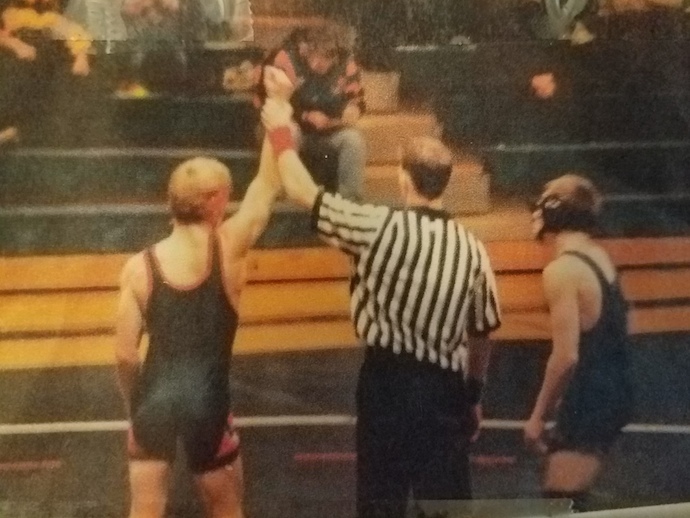 I usually did well enough to stay in the varsity lineup, though I was bumped around a lot—I usually was certified at 119, but I sometimes wrestled up to 125 or even 130 if it made it more likely that our team would do better. After the pre-match feast and a weekend of actually eating, I’d end up at around 130 pounds, and I’d have to lose about 8 percent of my weight in five days or so, a far cry from the 1.5 percent now recommended. I soon started dreading the start of a new week, and especially stepping on the scale in the locker room. Wedged into a small room the size of a confessional, it was a malevolent oracle—the news it gave was never good. My greatest moment as a wrestler came in a loss. A bad one. I was wrestling at 125, and I lost my main advantage at 119, sheer muscle, but my coaches must have known that I was a sacrificial lamb anyway. My opponent was Quincy Osborn. 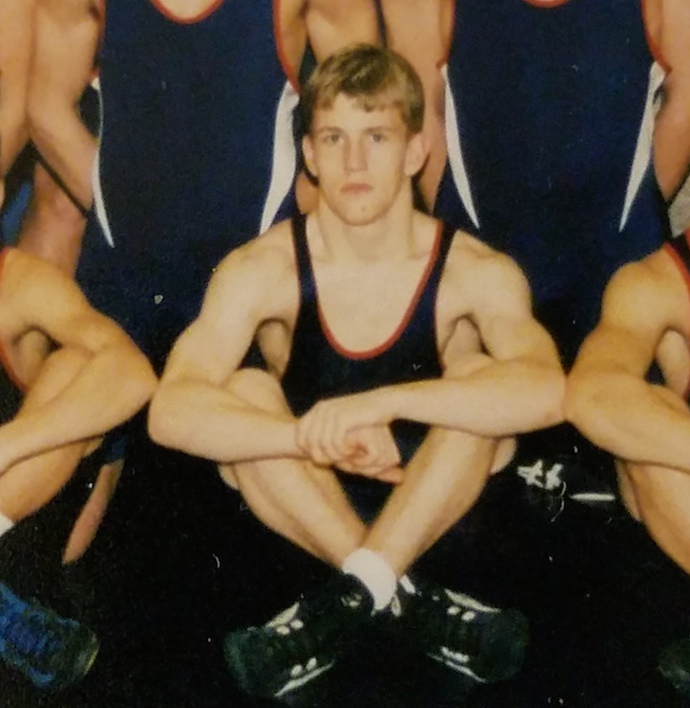 He was the state champion that year at 119 (and the champ at 125 the year after) and later wrestled at University of Minnesota, a NCAA Division I school, and then Augsburg, a Division III school, where he was national champion. Quincy Osborn won a 16-2 major decision at 125, one point away from a technical fall and just inches away from a dual meet winning fall as he had Brett Ortler on his back for the entire final minute. Eventually, cutting weight just became too much. My grades—which were normally quite good—had plummeted, so I told the coaches I wasn’t going to wrestle 119. I found myself ostracized from my teammates, which I had fully expected. One of my closest friends on the team was soon distant from me and later told me that I’d let them down. And I did, I suppose. We were better with me at 119 than with my replacement. Fifteen years later, I still feel ashamed to type this: I didn’t make weight. In retrospect again, I’m half glad I didn’t, because making weight for those two months likely left me with a condition that I’ll have for the rest of my life. I knew something was wrong when I kept waking up thirsty. It was the strangest thing—wrestling season had been over for three months—but I felt like I was still cutting weight again. No matter how much water I drank, twenty minutes would pass and I’d be parched again. And the more I drank, the more I had to use the bathroom. Soon, I was waking up every twenty minutes. I tried switching drinks: pop, soda, juice, milk. Nothing made any difference. This went on for a few weeks, so I went to the doctor. Given that increased thirst and urination are tied to diabetes mellitus, he tested my blood sugar. It was normal. The symptoms continued, so I went back in again a week or so later. He tested me again, and again, on another visit, with the same result. When I returned with the same complaints again, he had a new diagnosis: polydipsia, a disorder in which people are compelled to drink too much either because of dry mouth or because of psychological symptoms. In other words, he thought I was crazy. He suggested I ignore the thirst and recommended that I try chewing gum. I read up on polydipsia, and it didn’t seem like a match. I had no control over whether I was thirsty—so I kept digging, and I learned of diabetes inspidus. Despite its similar name, it has nothing to do with blood sugar at all; they only have the same name because they share intense thirst as a main symptom. There are two types of the disease—central and nephrogenic; in central DI, the pituitary gland is damaged—usually by a tumor or a head injury and it no longer produces ADH (anti-diuretic hormone), which helps regulates the fluid levels in the body. The nephrogenic form of the disease is caused by defects in the kidney structures itself. I visited my doctor again, and I asked him specifically about diabetes inspidus. He said it was exceedingly rare—about 1 in 10,000 people have it—but I insisted and asked for a second opinion. He directed me to another resident doctor, who referred me to an endrocrinologist. After conferring with her and telling her about my wrestling history, she recommended a water deprivation test. The test required abstaining from water and food for the night before, and during the test itself, which involved staying in the clinic for the better part of a morning and having my weight and blood monitored. The details are complicated, but she mentioned that diabetes insipidus would be confirmed if I lost four percent of my body weight over the course of four hours. I did, and let me tell you, from the start of the test, I was already uncomfortable. That only became more pronounced; by the end, I was curled up on the tiny exam bed, dreaming of water. After that, the results came back—I had joined the 1 in 10,000 club. I had central diabetes insipidus. I had no problem with my kidneys, but have a defect in my pituitary gland, which is thankfully easily treatable with half a tablet of medicine each day. I asked her if it could be tied to my wrestling, especially the yo-yoing between weight, and she said it might be—but there wasn’t any conclusive way to know for sure. Still, I’m reasonably confident that there’s a link; I never had similar symptoms before, and I only got them after repeated stretches of serious dehydration and hunger. My parents had warned me, and it seems were right: I simply cut too far, and part of my brain broke. But would I do it again? I’d certainly wrestle again—I picked up Judo in college precisely because it involves a lot of grappling—but when it comes to repeating my mistake, I don’t know. I’m genuinely ambivalent, which might seem odd for someone who may owe a lifelong malady to the sport. In this respect, I can sympathize with former NFL players, some of whom are nearly destitute and many plagued by traumatic brain injuries. While I don’t resemble them in the least—I’m half the size of Rudy Ruettiger—former pros get asked this question all the time. More often than not, the question is half accusation—You did this to yourself. When asked, many say they’d play again, and this almost always shocks the reporters and readers, but I think I understand what they’re talking about. It’s not about the money, if there ever was any, and which is almost always long gone. Or the fame on the field, which is fleeting, even just a season or two later. Instead, it’s reaching the height of your physical power and knowing that you have the discipline to get there. The actual abilities are ephemeral, but the achievement itself isn’t. In that respect, wrestling, and my relationship with it, has taught me a lot about nuance, about strength—physical and otherwise—and about taking risks. Even with an injury that’s likely attributable to the sport, I still think I’ve come out ahead. Sometimes you lose a bet that pays off in other ways.